Late spring in Rocky Mountain National Park can mean just about anything weather wise. Warm,cold,snow,lighting its a very fluid time of year in the park. Elevation plays a large part in affecting the weather as was the case this morning in Rocky. Longs Peak and the entire continental divide are covered with fresh snow. Lower elevations like Beaver Meadows and Moraine Park just had rain and fog overnight. 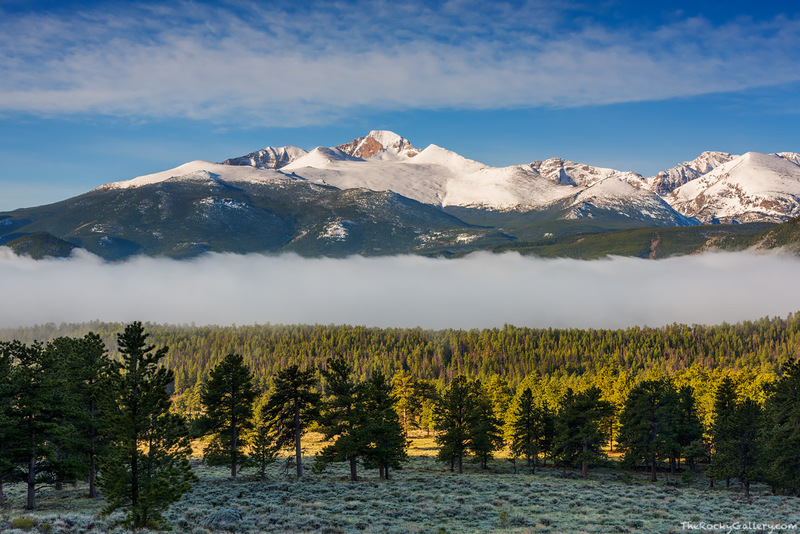 In this vantage from Beaver Meadows, fog can be seen over Moraine Park as the sun is shining on the pines of Beaver Meadows and Longs Peak and The Diamond formation stand out like a shining beacon. Photo © copyright by Thomas Mangan.